Cueva del Tesoro in Rincon de la Victoria (Malaga) is the only underwater cave in Europe and one of the three known around the world. As you can see it is an exclusive place, so I’m going to tell you some curiosities and facts about this cave. If you dare to visit it, here we go. If you are looking for the “Musical November” event, just follow the link to read information about the International Festival of the Cave. The information is at the bottom of this article. The formation of this cave probably did happen during the Jurassic period. 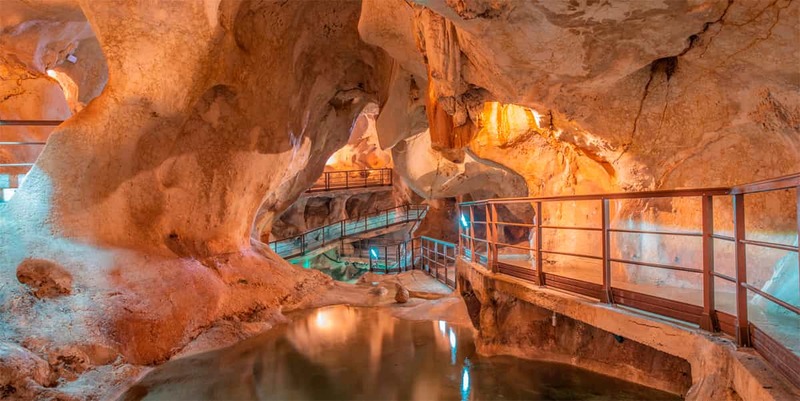 It is a limestone cave that emerged from the sea over the time in different stages. This evolution in stages and the infiltrations of fresh water produced a curious mixture of formations that happen both in underwater and terrestrial caves. The cave paintings and archaeological remains found show human activity in the cave throughout history. It has also been a place of ritual and sacrifices. Every year is celebrated the International Music Festival in the cave. Why is it called the Treasure Cave? The oldest name associated with the place is Cueva del Higueron; however its name changed over time as you will read below. According to the ancient legend, a royal treasure destined to Al-Andalus was lost by the 12th century. 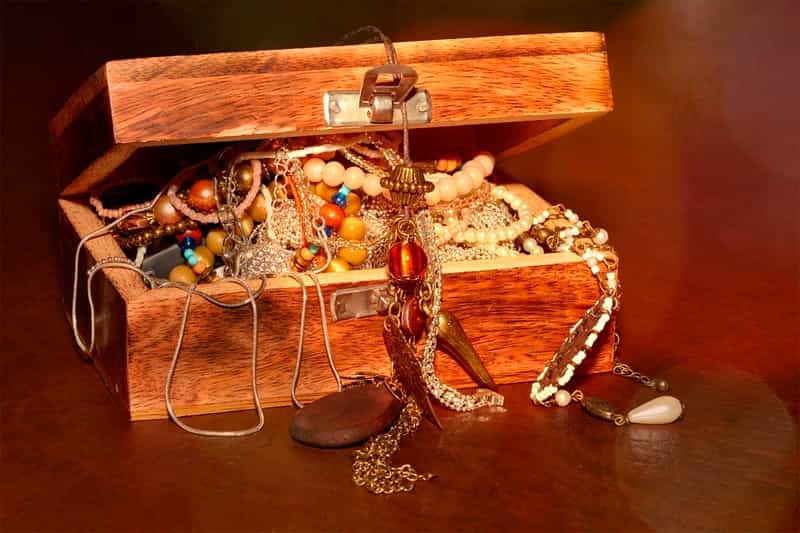 Several writers situate the treasure into the cave, although we do not know the reason behind it. Legends never die but grow over the years, and that is what happened with this place. The visit of a Swiss adventurer added the tragic element with which every good story needs to endure in time. Antonio de la Nari, Swiss by birth, spent almost 30 years searching for the legendary treasure; he had no doubts about its existence. He used dynamite to open new galleries and passageways, something that would end in disaster. During 1847 the legend of the treasure defeated him, dying because of one of the explosions. Perhaps he left after having found the true treasure of the cave, to be part of its legend; the cave would later be known as the “Cave of the Swiss”. The land belonging to the cave would be acquired at the beginning of the 20th century by a pharmacist with the intention of collecting herbs for his remedies. 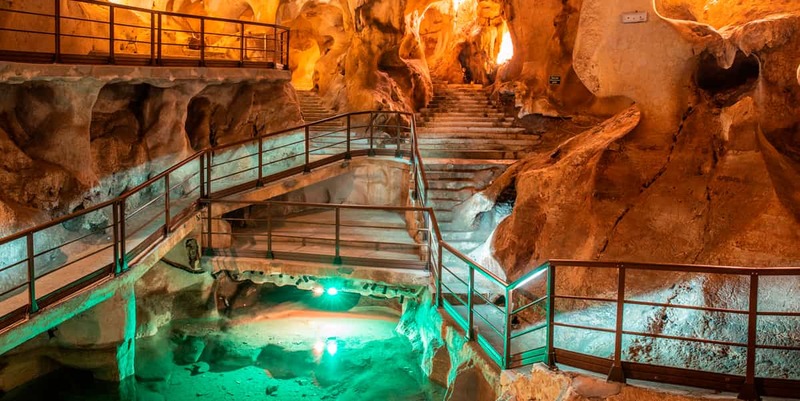 Over the years he sold the cave for the symbolic price of 1 peseta to his son Manuel, who with an adventurous aspiration dedicated his weekends to investigate the legend. Manuel found a candle with 6 Arab gold coins in the Virgin’s Hall; an area containing soil that apparently was removed. This led him to suspect that there might be some truth behind the legend, perhaps the treasure was buried there? During his research he finds Prehistoric remains, ceramics and some animal bones such as the fossilized bone of a bison. Until well into the 19th century there was a great fever in Andalusia for ancient and hidden treasures. It was said that the Arabs, on their escape, buried the treasures with the hope of recovering them on their return, who knows whether by themselves or through their descendants. There are many legends and some of them seem to be true. They are about people who disappear overnight, leaving behind a halo of mystery or the trace of a possible treasure. It is quite possible that the cave was one of the targets of those treasure hunters, more considering the legend it hosted for centuries. Who knows if any fortunate person managed to find such a precious trophy, as those who seemed to find one often vanished in silence; in those days having a great richness from one day to another was surely very dangerous. If finally someone found the treasure nobody knows. Perhaps it does not exist and it is better to let it remain part of the charm of this cave, its legend. Virgin Hall: This is the most recently discovered room. In this room was found the Arabic lamp with coins inside. Swiss’s Well: It may receive this name because one of the wells made by the Swiss treasure hunter. Zone of cave paintings: These paintings seem to be related to those found in the Cueva de la Pileta in Benaoján. Sometimes this area is not open to the visitors. Marco Crassus Hall: According to a local historian from the 18th century, Crassus used this hall as a hiding place for 8 months. Eagle Hall: Ir received the name because of a rock formation similarity with this bird of prey. Labyrinthine galleries: Some of the rock formations in this cave seem to play with light, perhaps giving rise to some of the ancient stories about mysterious inhabitants of the cave. Lakes Hall: Water currents and 3 natural lakes give the place a romantic atmosphere. Noctiluca Sanctuary Hall: In this room is the temple of the goddess Noctiluca with an altar where they found ashes of animal sacrifices. Volcano Hall: As it is the most interior room, it experiences an increase in temperature, hence its name. The Cueva del Tesoro has winter and summer opening hours. It is a recommended visit for families. Closed on 25 December, 1 and 6 January. The visit is free on Mondays. The calendar for this year of free concerts in Cueva del Tesoro is from November 9th to 23rd at 8 pm, except the last day on Friday November 23rd that is in Cala del Moral at 9 pm. Friday 16th: Sonoidal Ensemble saxophone quartet. Remember all those concerts are free, but the Treasure Cave has a capacity of 80 people. The Cueva del Tesoro (Treasure Cave) is in Rincón de la Victoria. You can get there by car via the A-7 road. There is a free parking. What should you take in consideration when smoking in Spain after the ban?